At Designer Smiles in Fargo One of the most common requests we get is for professional teeth whitening. 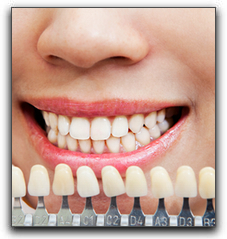 Teeth whitening has become very popular in recent years. Everyone, it seems, would like to have brighter teeth and a dazzling smile. And can you blame them? Some Fargo patients might be interested in bleaching their teeth at home. There are many affordable teeth whitening products available at any grocery store. From toothpastes to rinses to whitening strips, the possibilities may seem endless. In general they have the same whitening agents we use, but professional-grade whiteners are much stronger and produce far better results. It’s important to remember that once your teeth have been whitened, you need to take good care so that they’ll remain white for as long as possible. A lot of people don’t realize that the foods they eat and the drinks they consume can stain their teeth, and undo all of that whitening. To cite just one example, coffee is a big tooth-stainer. Having your teeth whitened doesn’t mean you need to give up your morning cup, though. But take care to rinse your mouth with water after you drink it, and brush if you’ve got the time. You have to do your part! At Designer Smiles in Fargo, teeth whitening is just one of the cosmetic dentistry services we offer. Call us today to schedule an appointment. What is Patient-Centered Dental Care?